Mix the meat with the oyster sauce and ginger. Heat the oil in a non-stick frying pan, stir fry the meat for approx. 2 mins., remove, mix with the soy sauce, cover and set aside. Place 1 sheet of rice paper in lukewarm water for approx. 30 secs. then lay on a damp cloth. 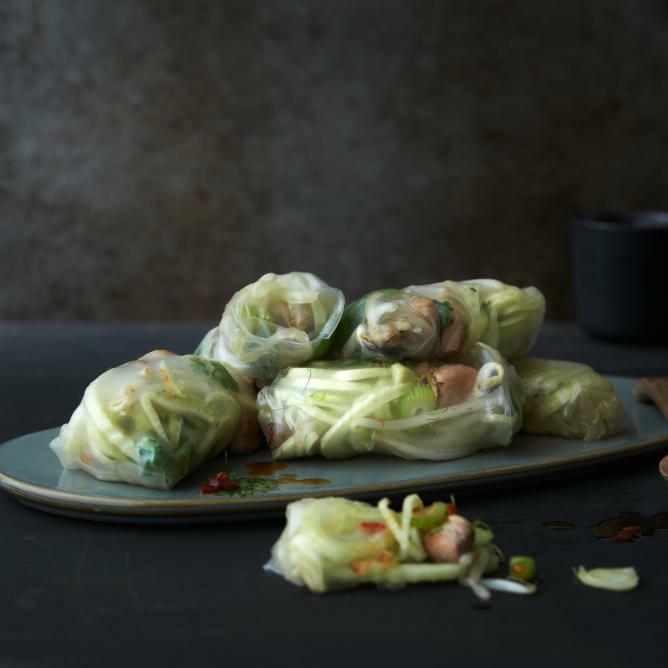 Place a few coriander leaves, a few bean sprouts, a little iceberg lettuce and pieces of meat in the centre of each sheet. Fold the rice paper inwards from the edges, roll up tightly. Repeat the process with the remaining ingredients. Mix the chilli pepper with the lime juice and soy sauce, serve alongside the spring rolls. Use basil instead of coriander.